This photo was taken during the last few moments of Bert Karnatz's life on July 15, 1934. The scene is the VFW Speedway, later to become Motor City Speedway in Detroit, Michigan. 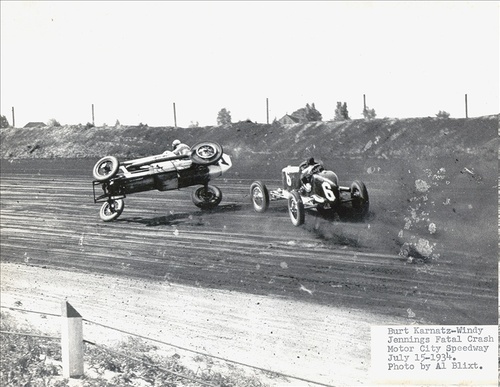 Bert, in the #1 car, is flipping over after his left rear tire was bumped by the car #6 of Windy Jennings. If you look carefully, you will see his tire is already flat. Bert rolled over the embankment and died soon after of a broken neck. Bert Karnatz is all but forgotten now; but he was described as a "legend" in his home state of Michigan at the time. In fact, he raced at Indianapolis and won races as far away as the board tracks of New Jersey. In this post I will tell you a little about Bert Karnatz and reflect on how close all of these drivers were to death in the 1930's and why we should remember them as people rather than statistics or historical curiosities. This photo was scanned from a print that hung in our basement recreation room when I was growing up in the 1950's. It was one of dozens of photos of races, drivers and other personalities that lined the walls. I loved playing in that "rec room" as a child. I never thought much about this photo then; it was just another one of my dad's great action pictures. Now, I look at it and I see the end of a life. Albert "Bert" Karnatz was 29 years old in 1934. He had been racing since his teens and was a very experienced driver. Bert had been to the Indianapolis 500 several times and started the 1929 race in a Miller, qualifying 31st and finishing 25th. 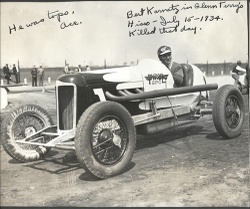 He was the winner of the last race run on the board track at Woodbridge, N.J. in 1931 before it was converted to dirt. He was also described as "an engineer of some note" who worked for Chrysler. On this July day he was at the Zeiter VFW Speedway in Detroit driving car #1 owned my Glenn Terry and powered by a "Hisso" (Hispano-Suziza) engine. This photo before the race was found in my father's scrap book. His inscription reads, "He was tops. Ace". One minute, he was in the feature race, competing wheel to wheel with Windy Jennings. In the next, it was over. Wheels bumped, a tire blew out and the beautiful #1 car began flipping over and over. The car went over the embankment and Bert's neck was broken. He died within minutes. This photo shows what was left after the crash. These were dangerous days to be a race car driver. The high-profile car design of the time offered no protection to drivers. Helmets were flimsy affairs, often made of leather over fiberboard. Seat belts were not always used and the idea of roll bars, roll cages, safety fuel tanks and all the other things we take for granted today were still far in the future. What happened on the rest of July 15, 1934 and in the days and weeks that followed, we can only imagine. Were any of his family in the stands? Were they breathless in the moments after the crash as emergency crews rushed the the scene? Was the terrible moment of realization then or was it later with a phone call to tell the family that Bert was dead? We don't know. There was surely a funeral attended by Bert's widowed mother, Louise along with Bert's two brothers: Arthur and Alfred and his four sisters: Edith, Luella, Marie and Edna. I am sure his racing friends were there also - maybe including Windy Jennings. There was probably a wake where people drank beer and told their favorite stories about Bert. But then, when everyone had gone home, the family, especially his mother, was left to grieve and to long for this young man who should have had most of his life yet to live. It was a story repeated many time in many homes in those years. 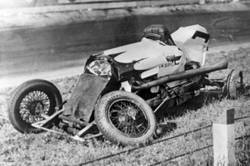 More than 25 drivers and riding mechanics lost their lives in 1934 alone. But, from what my dad told me, these young men weren't thinking about death at all. They were driven to race by a true passion. These were days of adventure and visions of glory. The men who built and drove cars in the 1930's loved mechanical challenges. They loved speed and competition. They were skilled craftsmen and often built cars from scratch. When I look at pictures from the era, each car seems to be unique. It was a time when individuals could dream and make their dreams happen with little in the way of organization or money. In 1934 you could go racing in the "big time" without corporate sponsorships, computers or even engineering degrees. These were the same kind of men as aviators like Charles Lindbergh who were inventing modern aviation on a shoe string, often doing it alone. Within a few years, racing would become more "professional" and that was a good thing. But for these guys - well, they were the pioneers on a journey of discovery making a path for others to follow. So, let's remember Bert Karnatz and all the Berts who were brave and foolhardy enough to test themselves against death just for the thrill of it. Credit for information: Motorsport Memorial and OldRacingCars.com.